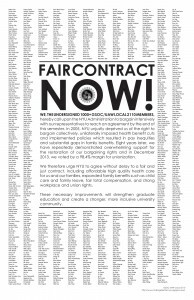 More than 1,000 signatures on our Open Letter for a Fair Contract Now to the Administration bargaining committee. We, the undersigned GSOC/UAW Local 2110 members, hereby call upon the NYU Administration to bargain intensively with our representatives to reach an agreement by the end of this semester. 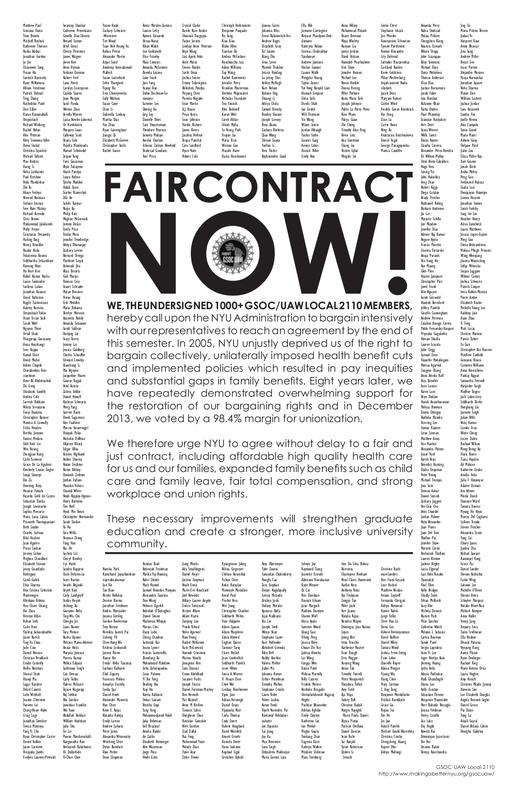 In 2005, NYU unjustly deprived us of the right to bargain collectively, unilaterally imposed health benefit cuts and implemented policies which resulted in pay inequities and substantial gaps in family benefits. Eight years later, we have repeatedly demonstrated overwhelming support for the restoration of our bargaining rights and in December 2013, we voted by a 98.4% margin for unionization. These necessary improvements will strengthen graduate education and create a stronger, more inclusive university community.